Seventh studio album from Australia's hardest-working band and follow-up to the excellent 'Naturaliste' album from 2003 is, dare we say it, the best Lucksmiths release yet! As always, there are lots of guitars, some soothing basslines, and a singing drummer who's far better than Phil Collins, but this time there's also a horn section having a party, some fiery organs, a string section who dig Phil Spector, and a lazy pedal steel. 'A Hiccup in Your Happiness' kicks the album off with an uplifting nod of reassurance to a girl named Louise. Coincidentally, this song also marks the recorded debut for new Lucksmiths guitarist Louis Richter. It's a dancefloor sizzler! As well as the aforementioned strings and horns, the song features some seriously funky guitar and a bassline possibly borrowed from Orange Juice. From there, the floor just keeps rumbling with 'The Music Next Door' and its pleasantly off-kilter guitar riff. By now it's evident Marty Donald's turns-of-phrase seem to have ripened with age, while Tali White's vocals are as warm as ever. As with the last few albums, producer Craig Pilkington was put to work on string and brass arrangements, and he's done some seriously wonderful things on 'Warmer Corners'. Notably, the string section on first single 'The Chapter in Your Life Entitled San Francisco' drops the song off effortlessly at the bridge (and the monumental first ever use of wah-wah). Later, the fruits of bassist Mark Monnone's relocation to Tasmania are on display, namely in the hobo lament 'I Don't Want to Walk Around Alone No More' which meanders along gently and runs head first into 'The Fog of Trujillo'. The former features superb whistling and beautiful acoustic guitar, while the latter, a sort of paean to a daydream, invites the horns back for another sangria and a rockin' party again ensues. As if that weren't enough, the album features seven more hits including an earnest Rickenbacker jangler called 'Sunlight In A Jar' and the tale of a Kansas City barbecue called 'Fiction' that builds to a zydeco wigout! We kid you not. 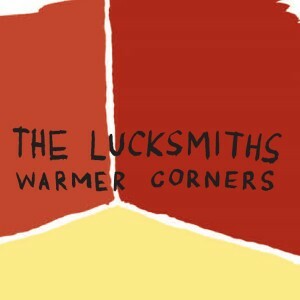 So, 'Warmer Corners': everything you've always wanted in a Lucksmiths album and more.